Getting its start as a trading point on the Big Blue River in the 1860s, the settlement was named for a chief of the Otoe tribe, Arkaketah. Oketo is one of the' oldest points to claim settlement in Marshall county. During the Mormon exodus and early rush for the western goldfields, many travelers took a short cut from a point which afterwards became Robidoux Station, and which was a mile north of what became Guittard Station, to this crossing. There were hunters, trappers and Indians along the Blue River in those days and this crossing was favorably located for winter quarters, having the advantage of being on a trail where the hunters could sell game and hides. This spot was located about a mile south of the present-day Oketo. In 1857 J. H. White settled on what became section 13, Oketo Township. By this time other “squatters” had come in and William Bond, Val Poor and others had taken land and some attempts at permanent settlement were made. In the early 1860s J. H. Whitehead came to the ford, built a store, barn and residence. These buildings were on the east side of the Blue River. The nearest post office on the east was Guittard Station and on the south, Marysville. In 1862 Ben Holladay decided to construct the Oketo “cut-off” on the Overland Stage line and employed George Guittard to do the work. The road being opened. J.H. Whitehead was put in charge of the station and also managed the ferry which Holladay had built. At that time, two saloons were in operation -- one on the east side and one on the west side of the Blue River. Keen business sense was evidenced in this arrangement as the same parties owned both. On the east side 20¢ was charged for a drink of whiskey and on the west 25¢ was the toll. Going east, passengers ‘could soon obtain refreshment, but westward the stations were farther apart and there was a consequent lapse of time between drinks. The little settlement with its big barn, blacksmith shop and store was attractive and scores of Indians congregated there to barter, quench their thirst with “tarantula juice,” and watch for the Overland stage. In the fall of 1864 Whitehead sold out to Asa Simpson and in the summer of 1865 the barn was burned. The store and dwelling had also been set on fire, but were saved by the stage boys. There being no barn on the east side, Holladay moved the station to the west side of the river. With the passing of the stage, the big barn, the store and the ferry, the original Oketo declined as a business point. In 1866 Irving Chapman built a dam across the Blue River and put up a flourmill. Soon after Z.H. Moore established a store and later built a house. The firm of Moore & Esterbrook opened fine stone quarries and this industry soon diverted settlement to that point. This industry was a valuable one to the growing town. The quality of the stone was unsurpassed and found a ready market in Lincoln, Beatrice, Grand Island and other towns of Kansas and Nebraska. A large number of men were employed in the quarries. A "new" Oketo was officially established on the line of the Marysville and Blue Valley Railroad and incorporated as a city in 1870. 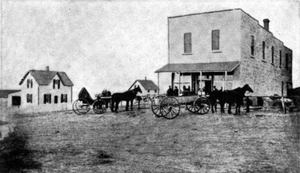 The post office in Oketo was established in May, 1873. In 1900, the community reached its peak population of 347. By 1910, the Union Pacific was providing transportation for agricultural products, the town boasted banking facilities, express and telegraph offices and a population of 253. In 1917, the town boasted a substantial bank, three grain elevators, flourmill, lumber yard, implement stores. harness shop, blacksmith shop, barber shop, drug store, hotel, an electric light plant, well-graded schools, a well-attended Methodist church, a full city government of women and a newspaper. At that time it was described: "The clean little town with substantial, even pretentious homes and well kept lawns, situated on a hill commanding a wide view of the surrounding country, challenges the admiration of the visitor." 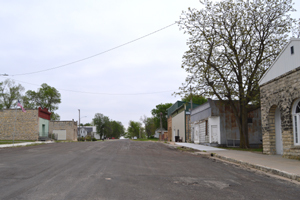 Over the years, the population fell and though it supports just about 64 people today, it still has a post office and is still incorporated. Oketo is located ten miles north of Marysville. Today, there are several interesting buildings and sites that represent Oketo's history that can be seen. The Oketo Museum operates from the old Z.H. Morre Store. This 1884 building is on the National Register of Historic Places. 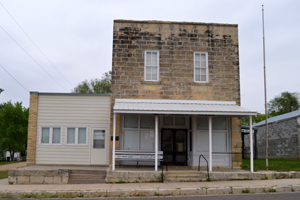 The museum has Otoe Indian artifacts, early telephone equipment, and replicas of a barbershop and a general store. It is open by appointment. Oketo State Bank Building, dating from the early 1900’s, now part of the Oketo Museum. The bank was established in 1889 by Z. H. Moore. Oketo City Hall was called the “Opera House” when it was first built in 1900. Traveling stock companies produced plays here for winter entertainment. It is now used as a community center. Oketo jail. Built in 1895, and equipped with rings in the floor for chaining prisoners. Moore house, 1904. General store and quarry owner Z. H. Moore and his wife Lavinia could not agree on whether to build a stone or frame house, so the first story is limestone and the second is frame with shingle siding. Oketo Cut-off marker. A shortcut used for several months in 1862-63 after the owner of the Overland Stage line had a falling-out with Marysville and decided his stagecoaches would bypass that town altogether. Just south of the marker is the grave of Louis Tibbets, who died in June 1861. On 12th road .3 mi south of Cherokee Road. Oketo stage line marker. On Cherokee Road just west of 11th Road. Redtop/Scully School. “Scully” was the name of a wealthy Irish family which owned and rented out thousands of acres in Marshall County and elsewhere in the Midwest. This building was used from 1898 until 1953. At 14th and Cherokee Roads. Blackmar, Frank W.; Kansas: A Cyclopedia of State History, Vol I; Standard Publishing Company, Chicago, IL 1912. Unearth America's Lost World! This 5-Part series ventures into the roots of our nations high hopes and hard labors to discover the towns that boomed fast and went bust even faster. Through original footage, interviews with experts and archival materials, this fascinating documentary takes viewers on an amazing journey through our abandoned history. From the deserts of California and mountains of Colorado to the forts, trails and battle sites of war, witness the precious remains of the past that only exist today as shadows of former glories and empty promises. First time on DVD! Legends of America's own Kathy Weiser-Alexander and Dave Alexander, along with noted Ghost Town author Philip Varney, authors Jeff Barnes, Kenneth Jessen and many more, even an appearance from Bob Boze Bell. Created and Produced by Award-Winning Documentarians, Centre Communications, exclusively for Mill Creek Entertainment. Total Running time 5 hours, 34 minutes.